IN JUNE Ram Kumar of village Jandwala Hadmanta in Punjab’s Abohar district received a cheque of Rs 5.20 lakh. In his 20 years as a farmer, Kumar had never held such a huge amount. The post-dated cheque for October 25 was given to him by a private company in Rajasthan to grow guar (cluster bean) in his farm. Besides the cheque, Vikas Chemigum (India) Limited, a guar gum manufacturing company, offered Kumar three incentives—39 kg of free guar seeds for his five-hectare farm, increase in price if market rates of guar rise and pick-up of the produce directly from the farm. Despite the perks, Kumar is not willing to encash the cheque; he is waiting for better prices. Under an informal contract, the company offers Kumar Rs 100 per kg. Kumar is expecting the prices to shoot up to Rs 300-Rs 400 per kg. In the financial year of 2011-12, prices increased 15 times from Rs 20 per kg in 2009-10. Like Kumar, Rai Bahadur of village Kalar Khera does not want to sell his guar produce at the current market rate of Rs 100-Rs 150 per kg. “Guar can be easily stored for two to three years. We will sell it only when we get premium prices,” says Bahadur. Following suit are thousands of cotton farmers in Punjab, Rajasthan and Madhya Pradesh. They have switched to guar ever since its prices started to soar. The increase in price is due to rise in demand and huge futures trading. Futures trading involves speculation of prices of a commodity, depending on its demand-supply prospects in the future. In this type of trading, buyers and sellers do not actually possess the commodity and the deals are done on paper (see box ‘Understanding futures trading’ p11). The demand is from the US which uses guar gum to extract shale gas—a natural gas trapped in shale formations. This gum, which is actually in powder form, is made by grinding guar seeds and has unique thickening and binding properties. It is also used in the food, oil and paper industries (see ‘Guar mine’, Down To Earth, July 16-31, 2012). A tonne of guar makes 300 kg of gum. Futures trading is a form of investment which involves speculating on the price of a commodity going up or down in the future. Trading is done through an agreement to buy or sell a specific quantity of a commodity at a certain future time at a specified price. No cash is exchanged when the agreement is made. People trading in futures are divided into two classes: hedger and speculators. A hedger is a producer of the commodity who gets into a futures contract to protect himself from future price changes in his product. Speculators are independent floor traders and private investors. They do not have any connection with the commodity and simply try to (a) make profit by buying a futures contract they expect to rise in price, or (b) sell a futures contract they expect to fall in price. In other words, they invest in futures in the same way they might invest in stocks and shares—by buying at a low price and selling at a higher price. Ajay Jakhar, president of Bharat Krishak Samaj, a farmers’ organisation, says, “Till last year I was growing cotton but increasing input costs were reducing my profits. When I saw farmers making huge profits from guar, I decided to experiment with it. Input costs of guar are 10-15 per cent of that of cotton and it does not require much attention.” Jakhar, who was a staunch supporter of Bt cotton, is planning to divert all his land in Abohar from cotton to guar. As per 2012 estimates, production of guar has increased from 1.3 million tonnes to 2 million tonnes, but local traders speculate the figure to be 2.5 million tonnes to 3 million tonnes. “Since farmers are reluctant to bring their produce in mandis, there is fluctuation in prices,” says trader Manoj Gupta in Sri Ganganagar, Rajasthan. From Rs 60 per kg in early October, the price soared to Rs 150 per kg by month-end. Speculation is helping another cash crop, though on a smaller scale. Soybean is exported in the form of soymeal. Farmers in Madhya Pradesh, the hub of soybean production and processing, are selling their produce at a rate higher than the minimum support price (MSP) of Rs 22.40 per kg. At the time of harvesting (late September to early October), the price for soybean was between Rs 26-Rs 27 per kg. Surinder Singh Thakur of village Umaria Khurd in Madhya Pradesh’s Indore district says that in 2011 market prices had exceeded Rs 30 per kg, but this year they have not increased much. 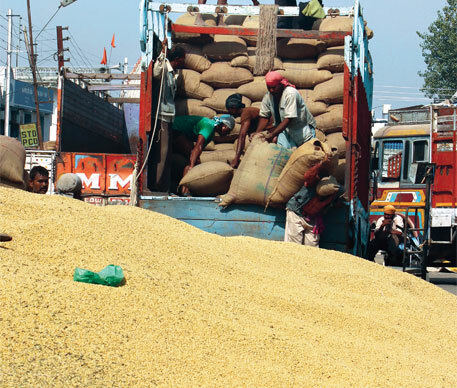 “Soybean was being traded between Rs 30 and Rs 31 per kg in mandis, but following a declaration in October by Soybean Processors Association that there is bumper crop, mandi traders in Indore are not offering more than Rs 25 per kg,” says Thakur. 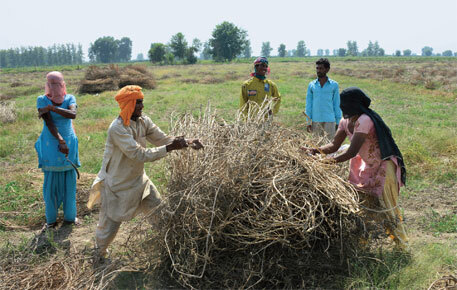 Farmers argue that 2011-12 proved to be an excellent year for both the crops as prices of guar rose by Rs 150 per kg and soybean by Rs 10 per kg. Last year’s prices for the two crops—a result of speculation and huge futures trading—have fuelled hopes of further price rise. Will the market be able to fulfil them? Until 2000, transaction of guar and soybean was limited to commission agents, traders and farmers. The Forward Market Commission (FMC), a regulatory authority for commodity futures market in the country, allowed futures trading of soybean and guar in 2001 and 2003, respectively. Futures trading is done through national and regional exchanges. In 2011-12, Multi Commodity Exchange of India Ltd (MCX), National Commodity & Derivative Exchange Ltd (NCDEX), National Board of Trade (NBOT) in Indore, National Multi Commodities Exchange and the ACE Derivatives & Commodity Exchange Ltd contributed to 99 per cent of the total value of the commodities traded. “Maximum trading for guar was done in NCDEX, while for soybean it was done in NBOT,” says Anand Goyal, director of Bikaner Commodity Exchange Ltd, which deals in futures trading of mustard and guar. “Futures trading in a commodity is a mechanism for price discovery and price risk management. It is useful for all sectors of the economy, including farmers and consumers,” says a spokesperson of NBOT who wishes to remain anonymous. The spokesperson explains that prices of agricultural commodities are at their lowest during harvest, as the supply exceeds the immediate, short-term demand by consumers, processors and other stakeholders. Prices increase substantially in the lean season. “This affects the farmers and consumers. Futures trading provides a market mechanism to balance this supply-demand pattern of agricultural commodities,” he adds. According to Goyal, futures market works on speculation. “It is a gamble because the commodity is not physically present,” he says. Referring to last year’s guar prices, Goyal says, “There was an international demand for guar gum and farmers were not aware of it. Big companies cashed on this opportunity and made windfall gains by trading in NCDEX.” He refused to divulge names of the big companies and traders. This year it is not that simple. “Farmers are alert now and guar and soybean are not arriving in huge amounts in mandis. Guar can be stored easily, so farmers plan to sell it only when prices are above Rs 100 per kg,” says trader Gupta. 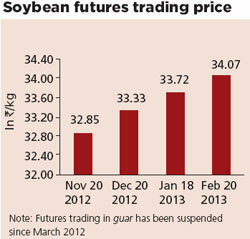 The prices are not increasing because futures trading of guar was stopped in March 2012. “When guar prices rose to Rs 300-Rs 400 per kg, futures trading was stopped by FMC to stabilise the market. As a consequence, present prices are hovering around Rs 100,” says a represntative of Indore’s Ruchi Soya Industries Ltd, which undertakes futures trading of guar. But Gupta is hopeful. “This year there is increasing demand from the food industry since its stock is almost over. Last year, it could not afford the high guar prices,” he adds. Demand and supply are the factors that trigger futures trading. In case even one of them decreases, the industry tries to catalyse it, says an economist working with a commodity exchange who does not wish to be named. Industrial associations have published reports, predicting bumper crop or loss that in turn fluctuates the market. “In the West, agricultural departments study the futures market, based on which production of a commodity is decided. But in India, the biggest drawback is that we do not have any reliable production figure. The farmer does not even know whether there is demand for his produce,” says the economist. A similar trend is witnessed in guar. Merchants and companies have pegged production of guar at almost double that of last year. This seems unlikely, at least that’s what discussions with the state agriculture departments of Punjab, Haryana and Rajasthan reveal. While in Rajasthan area under guar cultivation is almost the same as last year, Punjab and Haryana have increased acreage. Unwanted rain has reduced guar yields from 400 kg per hectare to 100 kg per hectare across the three states, say agricultural departments. According to the economist, predicting bumper crop leads to hoarding. “Traders and companies first try to reduce prices. When the supply recedes, they make money,” he adds. Futures trading helps both farmers and industry, says the representative of Ruchi Soya Industries Ltd. He says it was because of futures trading that farmers made money from guar and soya. The domestic market prices for guar and MSP for soy merely fulfil the input cost.